A Hungarian far-right politician urged the government to draw up lists of Jews who pose a "national security risk", stirring outrage among Jewish leaders who saw echoes of fascist policies that led to the Holocaust. Márton Gyöngyösi, leader of Hungary's third-strongest political party Jobbik, said the list was necessary because of heightened tensions following the brief conflict in Gaza and should include members of parliament. Opponents have condemned frequent anti-Semitic slurs and tough rhetoric against the Roma minority by Gyöngyösi's party as populist point scoring ahead of elections in 2014. But Jobbik has never called publicly for lists of Jews. Gyöngyösi's call came after Foreign Ministry State Secretary Zsolt Németh said Budapest favored a peaceful solution to the Israeli-Palestinian conflict as benefiting both Israelis with Hungarian ancestry, Hungarian Jews and Palestinians in Hungary. Gyöngyösi told Parliament: "I know how many people with Hungarian ancestry live in Israel, and how many Israeli Jews live in Hungary," according to a video posted on Jobbik's website late on Monday. The government released a terse condemnation of the remarks. Gyongyosi sought to play down his comments on Tuesday, saying he was referring to citizens with dual Israeli-Hungarian citizenship. Jobbik's anti-Semitic discourse often evokes a centuries-old blood libel – the accusation that Jews used Christians' blood in religious rituals. "Jobbik has moved from representing medieval superstition (of the blood libel) to openly Nazi ideologies," wrote Slomó Köves, chief rabbi of the Unified Hungarian Jewish Congregation. The group gained notoriety after founding the Hungarian Guard, an unarmed vigilante group reminiscent of World War Two-era far-right groups. It entered Parliament at the 2010 elections and now holds 44 of 386 seats. Hungary has been among European states worst hit by the recent economic crisis and the center-right government of Prime Minister Viktor Orbán has struggled to exit recession. "We now urge the Hungarian government to be as strong in addressing the numerous incidents of racist violence against other minorities in the country, in particular the Roma community. It needs to speak out against this violence and properly implement European anti-discrimination and hate crime laws." Following general election held in April 2010, Hungary's Prime Minister Viktor Orbán said that voters had carried out a "revolution" by giving his party Fidesz (EPP-affiliated) two thirds of the seats in parliament to rebuild Hungary after a near financial collapse. The Hungarian far-right party Jobbik (Movement for a better Hungary) also scored well in the elections, obtaining 47 seats in the 386-member parliament. It is the third largest party after Fidesz and the socialists. 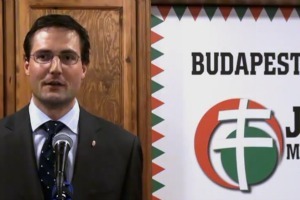 Although officially in opposition, Jobbik has a non-antagonistic relation with Fidesz. The two parties are seen as their political foes are much more close ideologically than they would like to appear. EURACTIV Greece: «Λ?στα Εβρα?ων» ζητ? η ουγγρικ? ακροδεξι? Disgusting!! Even more so in a post Holocaust World and in particular in a country that was a major player in that episode of humanity at its worst. But this is an example of a legitimate problem of dual (or more) citizenship and its worst manifestation, MULTI-passport holders, being exploited in foul ways to segregate an identifiable group, doing no worst than what many others NOT so identified are also doing. Hungary is particularly involved in stirring up latent feelings in negative ways with offers of unnecessary additional documents. Neighbouring countries such as Slovakia and Ukraine are being continuously solicited for 2nd, (or more) passports which only bring into question whether the holder has or has not any particular loyalty to other than monetary gains?? Let me tell you the facts before I call you are wrong! Major player in the second world war? Are you really so stupid or never been in the school? Hungary had no choice as the country still had a huge influence by the Austrian and German government. Hitler did told the Hungarian government: with us and you will live or agents us and you will all die! What Hungary could do about it when they just lost 66%of the entire country including the people who lived there, that was such a shock to the country that even now not just the country but the whole population are still suffering after 100years! Thats the reason of the dual national program; because till today more than 30% of the Hungarian population still living in countries who gave them not an equal quality education and no help at all some countries even not gave them pension after working 40years and they are starving to death! With this program the Hungarian government able to help to those people legally with out any other country could stop it. Thats the real reason behind the double nationalization passport program! Romas are 7% of the entire population. Entire crime 94% done by Romas!! From 1991 the government spending 165% more money for a roma children education than Hungarians one and still no effect so you cant even say the government not trying to do something about it! It will have progress but it is slow as in the Soviet-union they didn’t have to go to school or work for 50 years i guess we will need an other 30 years to have progress. 3, Counting the number of Jews in Hungary. Blowed up, stupid story for stupid people! government. For example: How can an Irish nationalist who also British, who working in the British parliament as an MP make the best decision for the British people. I think these questions are not racist at all but TV, and Newspaper targeting stupid people who quickly get angry and judge whole countries on one stupid news. David, you are wrong and maybe start doing a little research before you say something than you will have a chance to be informed probably. Major player in the second world war? Are you really saying this or never been in the school? I think these questions are not racist at all but TV, and Newspaper targeting people who quickly get angry and judge whole countries on one news. I see you agree with me on this point; even if you do not articulate it well. Dual citizenship recklessly passed about and particularly DUAL/Multi-passport holders are a problem. These are not unique to Hungary. Idiotic as it seems there are those with (example) USA-Iranian citizenship who travel the world with two (or more) pass ports; then when they are in trouble in one country bleat to the other for help! A person has no control over where shhe was born or over actions of parents when a minor child, but as passports are issued to adults these can and ought to be restricted to one per person; i.e one active citizenship; all others latent. As per the Roma, they suffered the brutality of the NAZI genocides as much (proportionally) as did Jews; this needs more recognition. I do not know from where come your spending figures but when an educational system is alien and designed to make a group into someone elses ideas of success it is bound to yield a poor cost/benefit analysis. As for the “major players” Hungary was joined by Poland, Ukraine, Austria, Slovakia, &c.. in not resisting as much as could be expected the NAZI ideas. The examples of Denmark (when Jews were required to display the Star of David, ALL Danes displayed the same) or the Serbs and Croats (where Hitler was at no time able to occupy completely all of Yugoslavia), come to mind. I share your concern about the rise of right wing populism but if you re-read my previous comment I did not isolate Hungary as any worse than many others. The unfortunate truth is that these types begin by sensing real problems and grievances such as the (TBTF) Banksters control of the economy of the world. Then they espouse what is at first common sense (eg. The True FINNS say, “let the banks exercise the right to succeed and consequently the concurrent right to FAIL”. Of course they are only correct to this point; they then diverge into hideous brutality, usually toward identifiable group differences. However had so called “progressives” been on the ball they would have invited the TBTFs to collapse and be ready to re-organize for the benefit of the 99%; unfortunately this did not happen 90 years ago and I fear the same in 2020 as per 1920, when British (TBTF) banks tried to squeeze all the costs of WWI that they had created out of Germany. Today the IMF, FED, and ‘The City’ are orchestrating a replay; they want to load their failings on to the 99% in the form of bailouts made into sovereign debts.